Jamestown (1973). 180 Fair Oaks St. This interior mural at the Jamestown CYO Community Center dramatizes the influx of drugs into the neighborhood. 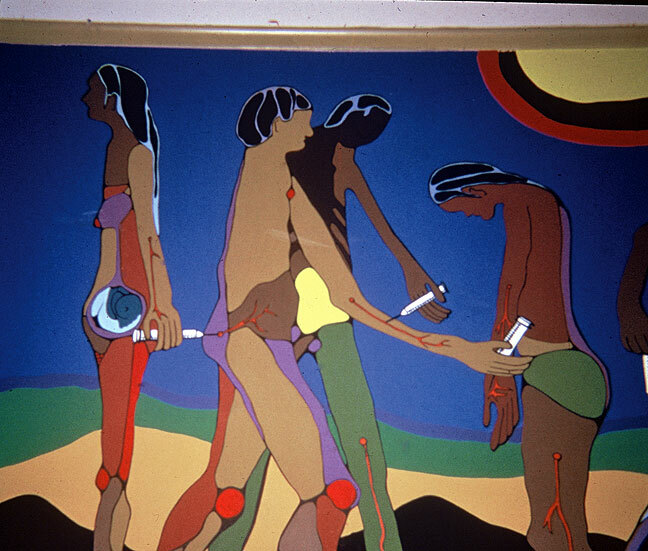 When drugs flooded the Mission, doing drugs became widespread. Besides the Hippies and the times, people believe the authorities were responsible for the flood of drugs; it was, literally, a flood. According to the suspicions the reason for the national authorities to do this was intentional, it was done to disorient the masses of politicised youth from being active and prevent them from activism. The time reds and heroin became available was exactly when huge numbers of Mission District youth started to become radicalized. Drugs had a detrimental effect on the Folsom Park youths and to the whole of this Mission District generation. Culture shock, alienation, personal, family, and social issues collided to have this effect on this generation—it was a perfect storm. Of course, not all the youths succumbed to this fate. The kids went on to hard drugs, it began with marijuana and alcohol, the hippies introduce LSD (or acid), but heroin was the straw that broke the camel’s back. The result was addiction, jail, disease and death as well as AIDS. Crack did not really affect this generation at this time. This flood didn’t effectively stop all activism; many went on to participate in youth groups and other groups; EMUNYO, America Latina Unida, MCO employment committee, and other stuff.